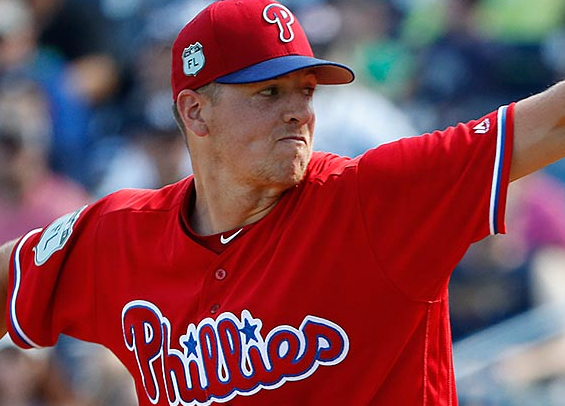 Philadelphia starter Nick Pivetta tossed six scoreless innings and pieced together one of his better stats of the season on Tuesday night as the Phillies secured a 5-2 victory over the Diamondbacks at Chase Field. Nick Williams put the Phillies on the board in the third inning, depositing a Zach Greinke fastball over the fence in right field to give the visitors a 1-0 lead. The Phillies went on to plate four more runs in the eighth to put the game out of reach. Pivetta surrendered five hits and walked one in the win. He struck out six and has now surrendered just two runs combined over his previous two starts. "The organization has continued to show a great degree of confidence in Nick Pivetta and this is Nick kind of rewarding the organization for its patience," Phillies manager Gabe Kapler said (see video). "He has been looking for ways to bring out these types of performances -- studying between starts, looking for ways to make adjustments, preparing his body physically and it all showed up for him." Reliever Victor Arano overcame a pair of defensive miscues in the eighth and cleaned up a shoddy performance from Aaron Loup to limit the D-Backs to scoring two runs in the eighth. "He weathered a pretty incredible storm out there," Kapler said (see video). "He was able to keep his wits about him, stay composed, stay under control and continue to deliver sharp pitches. He's been excellent for us all year." Pat Neshek secured the save, tossing a clean ninth to collect his second of the season. The victory maintains the 1 1/2 game lead the Phillies have in the NL East. The two clubs conclude their three-game set on Wednesday afternoon as Vince Velasquez opposes Patrick Corbin.